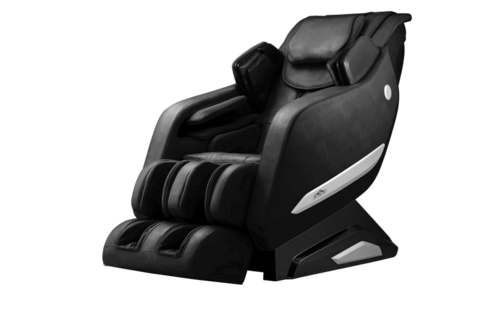 With our Rocking Rotation Technology, extra long L-shaped massage track, and the most advanced state-of-the-art massage features, the Daiwa Legacy is incomparable to any other luxury massage chair in the market. The 3D Body Scanning System delivers a massage that contours to the unique spine curvature of each individual user. 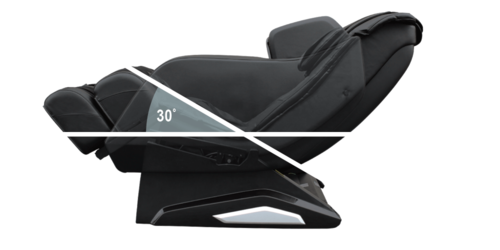 The 3D Body Scan System maps your back to ensure massage accuracy and efficiency. Gently rocks back and forth to generate the feel of a classic rocking chair. Sit or lie down, close your eyes, and enjoy the sensation of floating on air –while your entire body indulges in a luxurious massage. The Legacy features an extra-long, L-shaped massage track, running from the shoulders to the hamstrings. 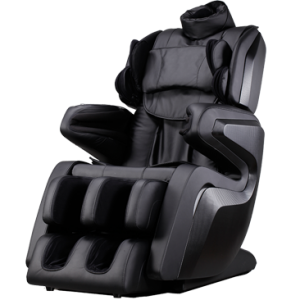 Unlike other luxury chairs that only offer the S-shaped massage track along the backrest, the Daiwa Legacy takes it one step further by offering the supreme full-body massage experience. 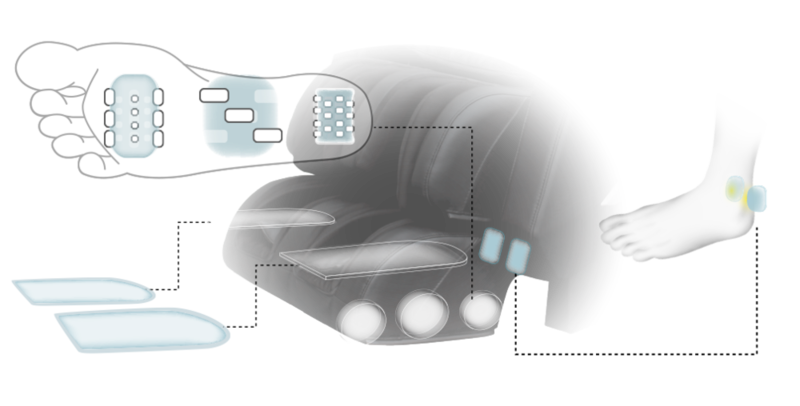 This feature is unmatched by any other massage chair on the market. Indulge in the closest full-body massage you have ever experienced! 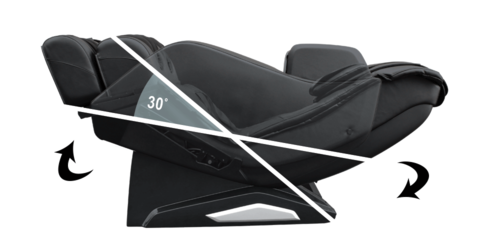 The zero gravity experience, moves the seat to the ideal 30-degree angle in order to appropriately distribute body weight and reduce pressure on the body, delivering the ultimate in comfort, and achieving a floating sensation. 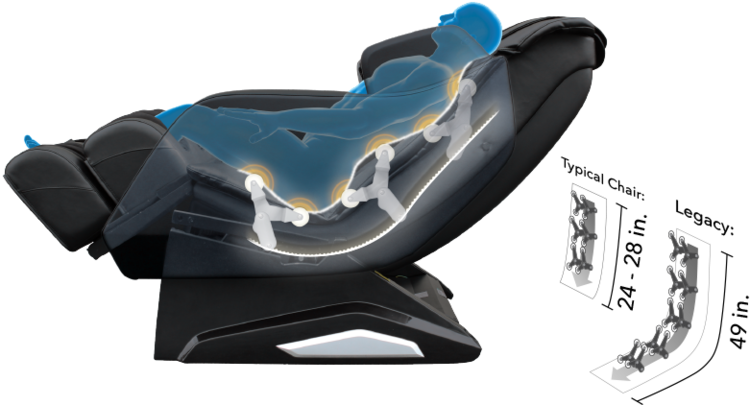 Set the chair into zero gravity position and remove all stress on the muscles and experience a weightless environment. 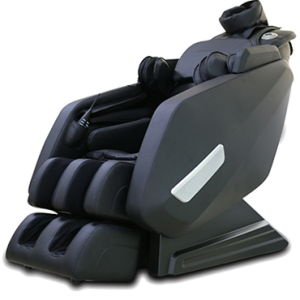 Press the zero gravity button again to elevate the legs above the heart for additional relaxation. Drawing upon the principles of reflexology, our foot rollers activate nerve endings on the feet to relieve tension, improve circulation, and renew vitality. Our three different foot rollers target the feet’s specific needs. 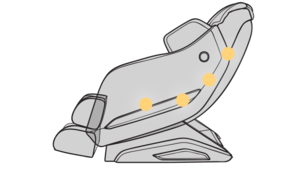 Foot pads are included to adjust the strength of the foot rollers to your preference. 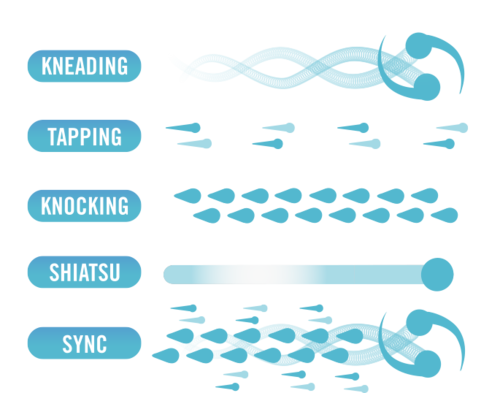 Ankle Grips cradles your ankles in place to thoroughly massage the foot soles, ankles, and calves. 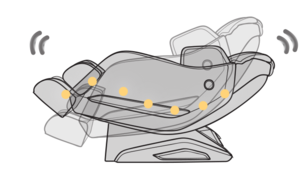 Undulating airbags surrounding the foot inflate and deflate to mimic the alternating compression technique of a live massage. 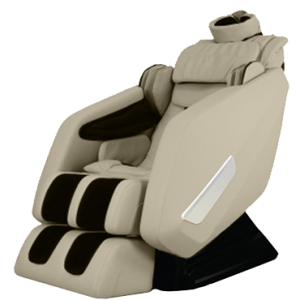 48 airbags are built into the chair and rhythmically inflate and deflate during your massage session. 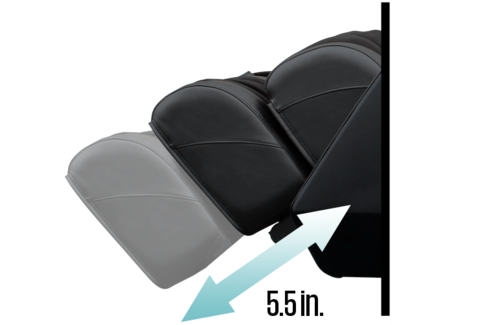 The airbags stretch muscles to loosen tension with a soft massge that improves circulation and relieves body fatigue.  The airbags are located on the shoulders, around the arm, and even under the thighs and calves to give a full-body stretch. Feel pampered from head to toe! 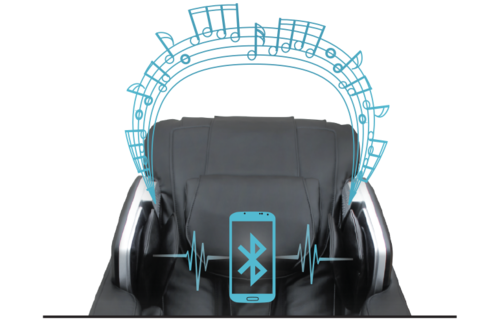 Experience the benefits of music therapy wirelessly! 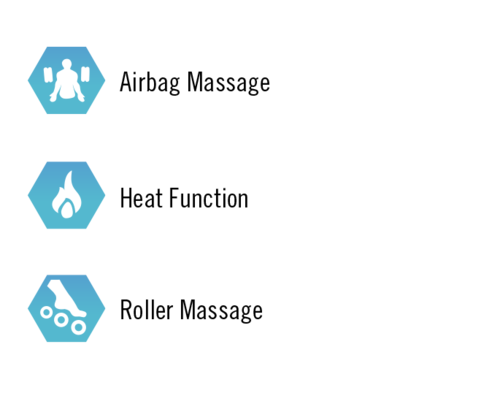 Bluetooth technology wirelessly connects such devices as your iPod®, iPhone®, iPad®, Android™ devices, and more. High quality compact speakers are mounted above the shoulder massagers that aim at your ears for a surround sound experience. 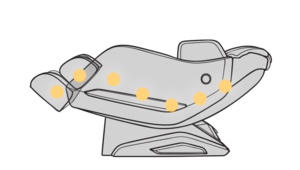 Our heat function provides warmth and soothing relief from aches and pains. 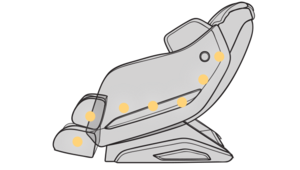 In alignment with the L-shaped massage track, the heat extends all the way to the hamstrings. Heat therapy helps ease tension and stress. It is great for relieving arthritis pain and sore muscles. 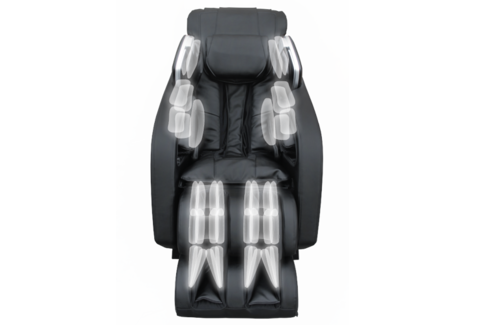 The fully adjustable leg massager provides firm shiatsu pressure against the backs and sides of both calves as well as the soles, insteps and heels. 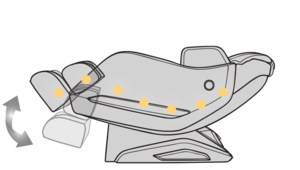 The leg massager extends up to 5.5 inches to fit most body types. Who wants to interrupt a massage to navigate complex program options and commands? Or deal with loud noises from massage mechanisms while trying to relax? 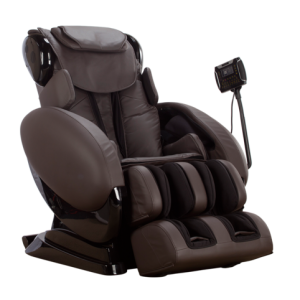 The LEGACY eliminates all of these distractions by operating silently during and in between massage options, smoothly running of the motor and the massage mechanisms, and by having short-circuit and overheat protection.